Create an impactful, designer and stylish look in your living or dining room with the stunning Aria Glass and Espresso Dark Wood Sideboard. 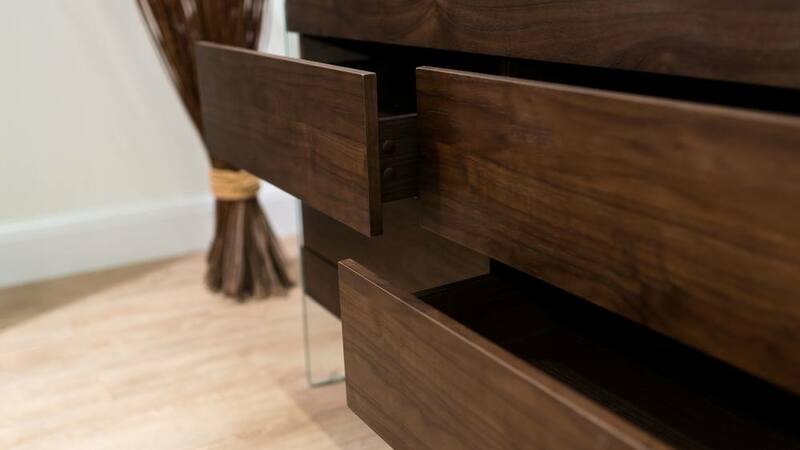 This luxurious storage unit allows you to store a variety of household items in each of its four soft close drawers, while also being a display unit for your favourite pieces. 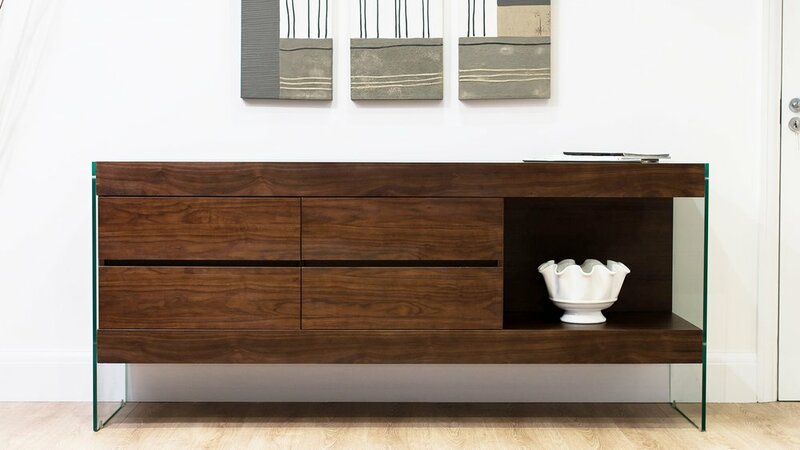 The mix of the rich dark wood veneer combined with the crisp, clean tempered glass legs really gives this sideboard a sleek and refined appearance, making it the perfect piece if you are looking for a truly stunning storage solution for your home! The Aria sideboard has 4 well sized, solid draws which all have 'soft' closures. This results in the unit not needing handles, keeping the front looking smooth and streamlined while also accentuating the Aria's overall elegant and refined appearance. For the top 2 draws the handles are underneath and for the bottom 2 draws the handles are on the top. 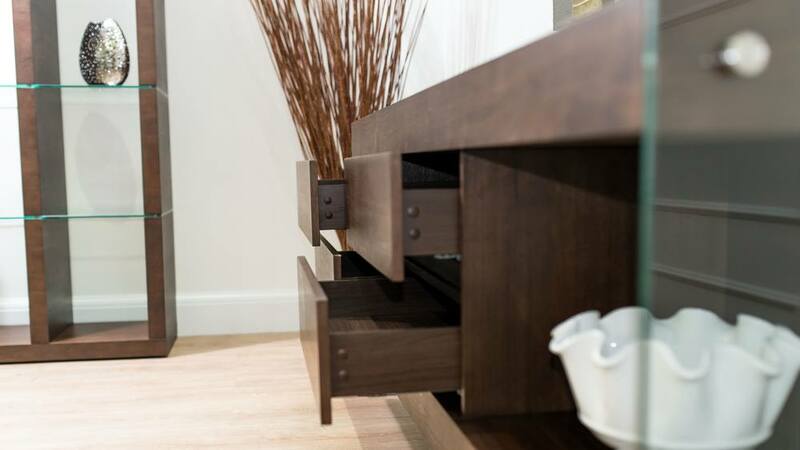 This clever design is all for ease of access and practicality when using this stunning sideboard. 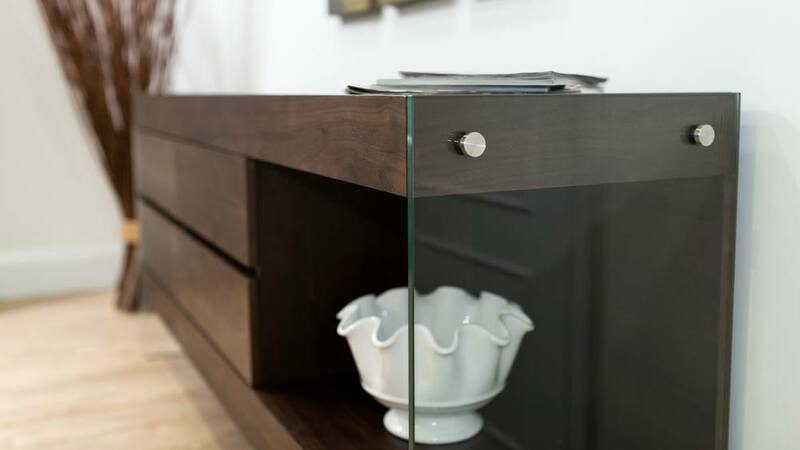 With the Aria Glass and Espresso Dark Wood Sideboard, you are able to store items both away from view in the draws and in the large display shelf in the front of the unit. This allows you to really make this piece your own, showcasing your favourite flowers, timeless ornaments or cherished family photos. The Aria sideboard can hold weights of around 5KG in the drawer and 10KG on the shelf. This makes the unit well suited to storing and styling a wide variety of objects, giving you peace of mind that the unit will be able to fully support them. 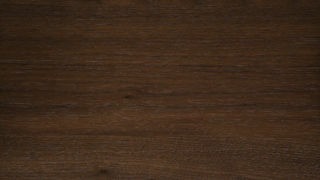 The dark wood veneer is a rich and luxurious finish. This is complemented by the two tempered glass legs on either side, which adds to both the tactile quality of this unit and its designer look. 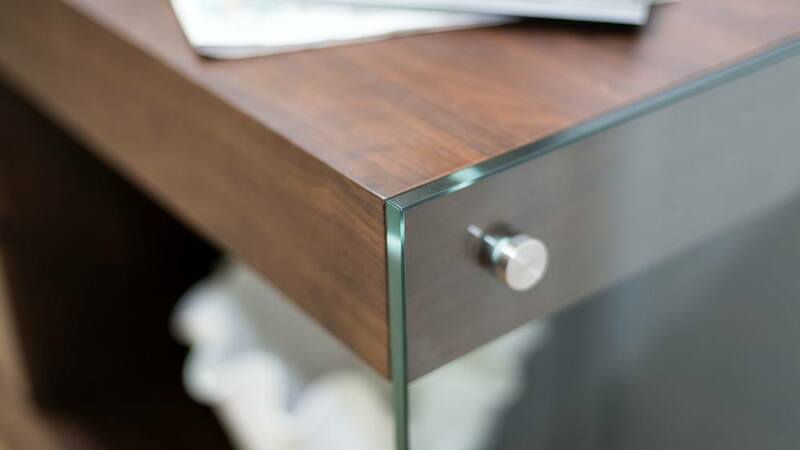 The supporting legs are made from 12mm thick tempered clear glass. The glass used has been rigorously tested for strength and durability, certified to British Standards to test the quality of toughening and strength against impact. This rigorous testing is all to give you complete peace of mind, knowing you are choosing a sideboard that has been created with safety, durability and quality in mind. 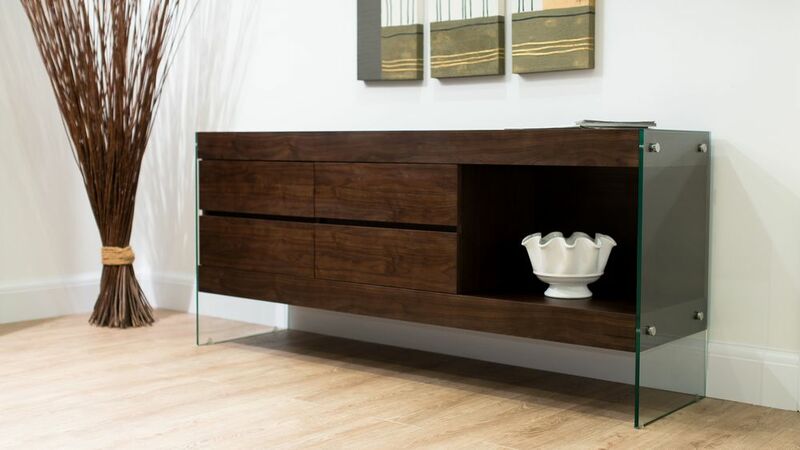 A rich wood tone, a contemporary glass leg frame and ample storage space for a variety of items- the Aria Glass and Espresso Dark Wood Sideboard has it all! 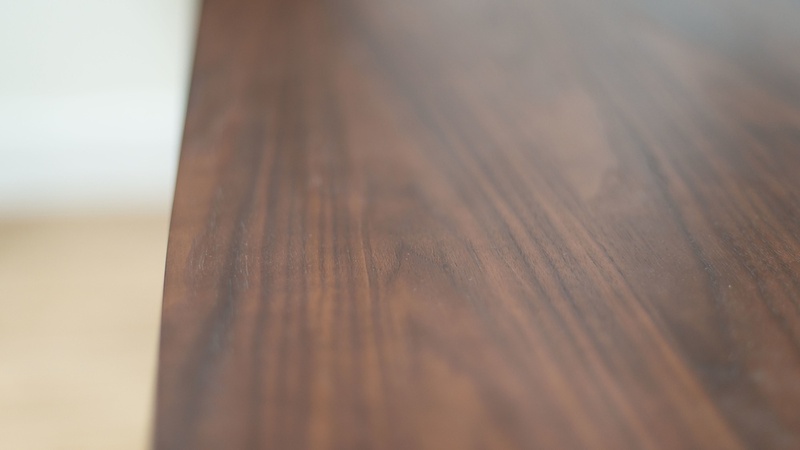 If you like this design but are looking for a lighter finish, the Aria is also available in white oak, so why not see which finish will best suit your interior. The Aria sideboard is part of our stunning Aria Collection, which contains a range of sideboards, dining and coffee tables and large shelving units.